Chittenango Erie Canal Park – Haunted?? It’s a quiet, pretty walk along the Erie Canal path in Chittenango. The area’s history dates back centuries. However, you might not be aware its rich paranormal activity. “When we first started investigating the Erie Canal, we came as a fluke. We didn’t really expect much, but we did get a lot of evidence,” said Stacey Jones, the founder of CNY Ghost Hunters. The original Erie Canal is actually half a mile up the road. It was 40 feet wide and four feet deep. It was used from the 1820s through the 1850s. The area is believed to be haunted. “There was an outbreak of Cholera at one point and a lot of the people building the canal were buried out in the woods and were not given proper burials,” said Jones. This canal, or the Enlarged Erie Canal was expanded to 70 feet wide and 7 feet deep to allow for larger barges. It was used from the 1850s through 1917. It also has its share of paranormal stories. In the 1800s, a Sheriff and his horse died there. “The lore surrounding it is that the horse got spooked by something that was on the other side of the canal and it was describe as being something like a ghost-like figure or a shadow figure. And that’s what ended up spooking the horse and killing them both,” said Jones. That death was documented in local papers. Two other deaths were also well known. “The boiler exploded here in 1906. And there was two men killed. One guy was pushed through the building by timbers and was crushed and died later on that night. The other one had his head blown off. And the body was found down in the woods down there, and they never did find his head,” said Rainbow. However, there’s one death that very few people know about. In a dying message to his sister, a man told her about a boy who he and his friend witnessed drown in the canal when they were just 10 or 12 years old. And before the sister died, she told the story to Douglas Rainbow, the Co-Founder of the Chittenango Landing Canal Boat Museum. “This kid was from out of town and they goaded him into jumping off the bridge, which he went into the mud head first. I don’t think he jumped. I think he was pushed. And they realized that he died. He suffocated and died. And they didn’t know what to do with him. And there was an old barge parked along here, called the “Beech Nut.” And it was far enough away from the wall, and they buried the body in the mud,” said Rainbow. There isn’t any record of the death. “You didn’t report it nationwide. It didn’t go out in a bulletin. You went to your local PD if you son or grandson was missing. And generally, that’s as far as it went,” said Rainbow. Stacey Jones and her team, the CNY Ghost Hunters, have done several paranormal investigations there. Jones and her team say it’s the compelling evidence they get every visit that will keep them coming back for years to come. People in Oswego interested in exploring nature may feel like the closest options are in the Adirondacks hours away, but Oswego actually has a few places of its own that give students a taste of nature. It may be surprising to some Oswego State students that there are impressive hiking trails close to campus. On the site of Rice Creek Field Station, less than a mile and a half there are trails that might at first appear untouched for years. However, that is also what gives Rice Creek its appeal. There are a few indications that civilization has touched the area, like the occasional telephone pole and some foot bridges to cross streams. For students looking to explore trails that make them feel like the only living things around are animals, Rice Creek is perfect. With the scenery flying by, and the feeling of pure nature, these trails are great for an outdoor run. Unfortunately, not many students actually know about the existence of Rice Creek, or its trails. Nature paths as beautiful and pure as Rice Creek are resources that provide a lot for students, and since it’s so close to campus, and now accessible via the Green Laker Shuttle, maybe the trails will be used and appreciated to the fullest. For students willing to take a short trip, Sterling Nature Center, about 10 miles away, has even more to explore. Sitting on 1,200 acres, the park features over 10 trails equaling 1.9 miles along the untouched shores of Lake Ontario. The park also offers major attractions during the year, ranging from canoeing and watching the sun set in summer, to snow-shoeing and cross-country skiing in the winter. Whether you are going to take a run, take photos, or just escape from everyday life, a trip to either of these sites is definitely worth the time. 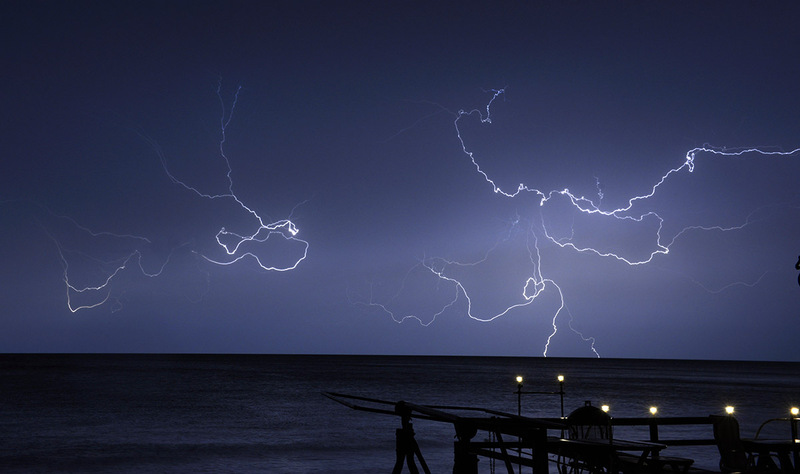 James C. Montanus put his camera on a tripod, and used a 30 second time exposure in order to capture the dramatic lightning over Lake Ontario. Click here o find out more about the Erie Canway Tour.